New Micro Fishing Sport Focuses On How Many Little Fish One Can Catch Want to hear a really big fish story? These guys don't. They're micro-fishers, seeking out the smallest fish and the largest number of species in this relatively new sport. 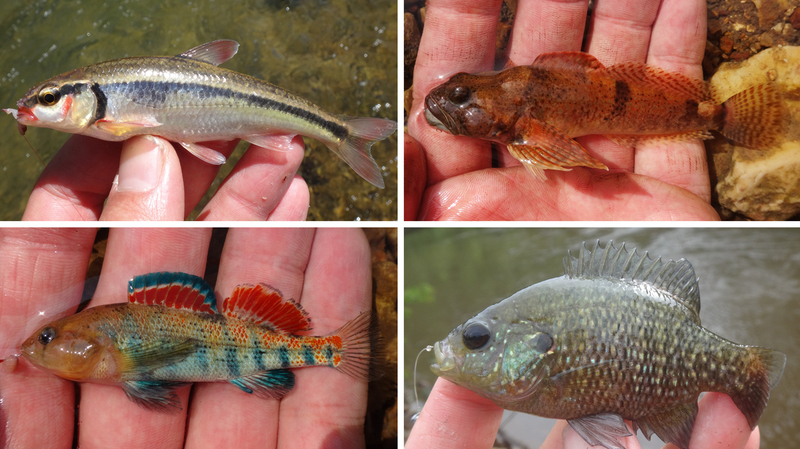 Micro-fish caught by Ben Cantrell: (top row) bleeding shiner, knobfin sculpin, (bottom row) plateau darter and bantam sunfish. Catching the biggest fish usually comes with the biggest bragging rights, but now a new breed of anglers working to hook those at the other end of the spectrum. The catch might not be as big, the bragging rights are. As the owner of Tombstone Tackle bait shop in Columbia, Mo., Adam Wolf has a lot of ways to catch fish. "Night crawlers, minnows, shiners, goldfish, and the frozen bait like chicken liver, turkey liver, shad guts, shad sides, skipjack herring, vacuum seal whole shad," says Wolf as his list of lures goes on. Wolf likes catching big fish. Really big fish. "I caught two 96-pound blue cats, biggest bass are probably around 10 pounds, biggest crappie I caught two three pound crappie," Wolf says. As Wolf's list shows, fishers looking for bait that the big fish will bite have lots of options. But when anglers look to land fish closer to the size of the bait in Wolf's shop, a new sport rises. It's called micro-fishing, and it's growing in popularity. How Do You Anesthetize A Goldfish? Micro-fishers target not just the smallest fish, but the largest number of species — a process known as life-listing. It's like what birders do, but for fish caught with a rod and a reel. Across town from Wolf's bait shop, Michael Moore — no, not the documentary film director — is wading in a shallow creek turning over rocks and looking for tiny bugs to use as bait. It looks like he's found a few. "Oh gosh, I think they're eating each other — um, I have not taken aquatic entomology, but most of them are different kinds of mayflies," he says. Moore, a doctoral student in fisheries conservation at the University of Missouri, is on one of his first micro-fishing expeditions. As schools of sand shiners flit about in a rocky pool, Moore explains the type of gear this hobby demands. "Micro-fishing, you're using the smallest-size hook you can find at your local tackle stores, so your fly fishing hooks and things like that," Moore says. "And instead of casting, like you would with regular fishing, it feels really weird, but you're usually just dangling the bait in front of fish that you can see." Moore puts one of his mayflies on a hook, and dangles it in the water. Only a minute passes before he gets a bite. "So this is a little bluegill. You can catch a lot of these on regular lures too, but ones this small are usually hard to catch," Moore says. To get hooks small enough to catch a lot of micro-fish species, micro-fishers sometimes have to order from Japan, where the hobby is more popular. In the U.S. the fish species with the biggest variety are minnows and darters. With that many options, you want to have the right hooks. "Some people have like 400 species on their list and they're adding to it all the time," Moore says. Those people include Ben Cantrell, a micro-fishing enthusiast in Peoria, Ill., who runs the website microfishing.com and its associated Facebook page. "Well I just passed 400 on a trip earlier this summer," Cantrell says. "I'm nowhere near the top. There's a guy out in California, Steve Wozniak — not the co-founder of Apple — he's got 1,600 or so." In seeking out new species to add to their list, micro-fishers sometimes resort to extreme measures, like driving across several states to catch just one specific species, or camping out on frozen lakes, using sonar to target fish. The sport certainly isn't for everyone, and Cantrell is used to people thinking his hobby is a little weird. "A lot of people will ask us what we're doing when they see us fishing," says Cantrell. "Some people are puzzled, some people are interested and sometimes we convert someone into trying." Cantrell says the hobby is growing, convert by convert, which will likely translate to a lot of pictures of little fish, and a lot of little fish stories.